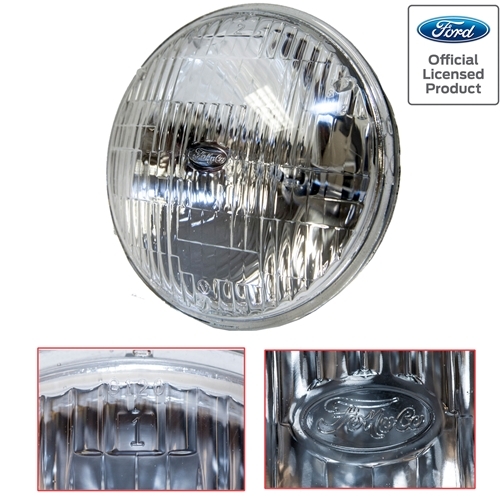 Officially licensed by Ford, Scott Drakes 5 3/4” Round High Beam Halogen Sealed Headlamps feature authentic Ford markings and upgraded Halogen performance. This is a reproduction of a very desirable and rare version headlamp used on most classic Fords in late 1950’s and 1960’s. We took NOS new original Ford bulbs and duplicated them in appearance while improving them with Halogen lighting technology. Halogen headlamps produce more than double the lighting power of original Tungsten bulbs. Perfect for drivers or trailer queens, a great safety improvement while maintaining an original look. Over the years Ford offered two FoMoCo script versions: one sand blasted etched logo, and the other a prominent reverse raised FoMoCo logo about 7/8” wide. We chose to reproduce the rare, highly sought reverse raised logo version, which is more attractive and easier to read. Featuring a single filament bulb with a 50 watt low beam. Fits most Fords and Mercury’s including: 1969 Mustang; 1962-70 Fairlane; 1960-70 full-size Ford; 1967-71 Ranchero; 1958-66 Thunderbird; 1968-71 Torino; 1960-69 Comet; 1967-70 Cougar; 1964-71 Cyclone; 1960-70 full-size Mercury.